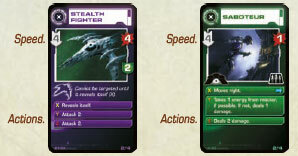 Choose a difficulty level for serious threats and prepare external and internal serious threat decks. The difficulty level for serious threats can be different from that chosen for common threats, but in each case, the internal and external threat deck should be at the same level. Choose colors. Choose players to take the roles of captain, communications officer, and chief of security. One player may take multiple roles. Choose a soundtrack. For a full game (a mission) choose one of the eight mission tracks from the CD's mission folder. Start the soundtrack or start reading the Scenario card. Pick up your 5 first phase action cards. You are not allowed to show your cards to other players, but talking about them is allowed. You plan your actions for the first phase by playing your cards face down on the 1-3 spaces of your Action Board. You can play your card with either half on top. From the back of the card, anyone can see whether the action half or the movement half is on top. Your action for that turn is determined by the top half of the card. The bottom half has no effect. If no card is played on a space, you take no action on that turn. When planning actions for a phase, you can change the cards you played any time before you end the phase. You end the first phase by picking up your second phase cards (and adding them to the cards left over from the first phase). Once you pick up your second phase cards, you start planning actions for turns 4-7. You can look at your first phase cards, but you can no longer change them. You can plan second phase actions until you pick up your third phase cards. This starts your third phase, during which you plan actions 8-12 until the end of the Action Round. Heroic actions also have a movement half and an action half. They are played the same way. 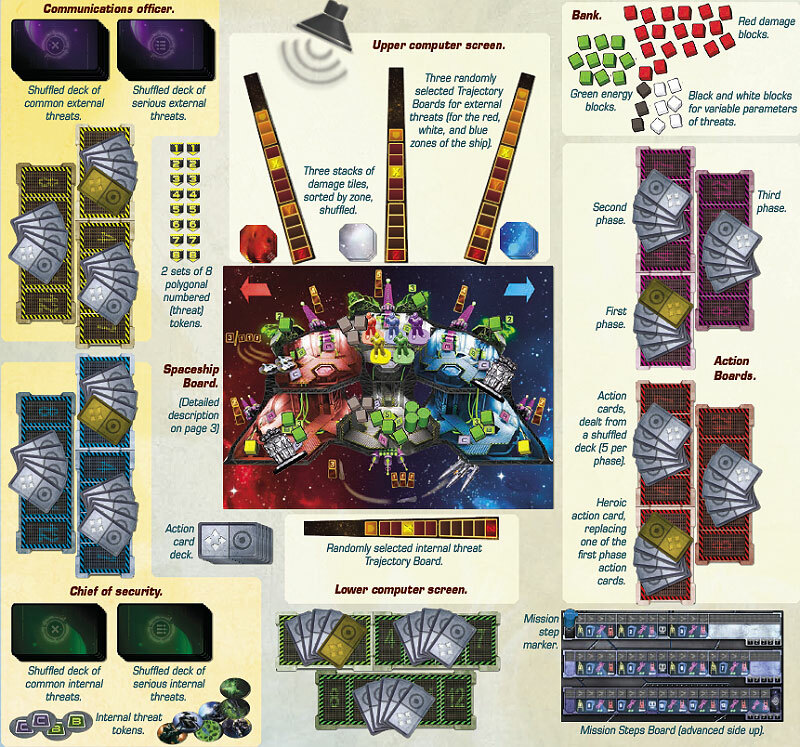 During the Action Round, you are allowed to use the game boards and pieces to indicate what you are planning, but only your planned actions have any effect on the game. Alert. Enemy activity detected. Please begin first phase. This indicates the beginning of the Action Round. The communications officer draws the top card of the common (or serious) external threat deck, places it face up near the Trajectory Board corresponding to the specified zone, and gives it a polygonal token with the number corresponding to the indicated time. The chief of security draws the top card of the common (or serious) internal threat deck, places it face up near the internal threat Trajectory Board, and gives it a polygonal token with the number corresponding to the indicated time. The announcement following these words is for a five-player game. With fewer players, it should be ignored. Each player may draw one card from the action card deck. Data transfer. Repeat. Data transfer in five, four, three, two, one, . Data transfer complete. Each player can give one card to any other player. The card must pass from hand to hand before the beep. Heroic actions cannot be transferred. Communication system down ... Communications restored. Between these two announcements, players are not allowed to communicate with each other. First (second) phase ends in one minute. First (second) phase ends in twenty seconds. First (second) phase ends in five, four, three, two, one. First (second) phase has ended. When the end of a phase is announced, you can no longer plan actions for that phase. Pick up your cards for the new phase (if you have not already done so) and begin planning actions for it. You can end the phase you are working on and begin the next one even before these announcements, independently of the other players. Operation ends in one minute. Operation ends in twenty seconds. Operation ends in five, four, three, two, one. Mission complete. Jumping to hyperspace. This ends the Action Round. Players can also agree to end the Action Round at any time after the end-of-second-phase announcement. Return the game pieces to the initial setup position. Use the Scenario card to check that the communications officer and chief of security assigned the threat cards the proper trajectories and numbers. Correct any mistakes, adding any missing threats. Move the mission step marker along the Mission Steps Board and handle the indicated steps. If there is a threat card with this number, place a second token with the same number on the first space of the threat's Trajectory Board. For an external threat, this token represents its position. For an internal threat, this token keeps track of its progress. For a malfunction, take an oval token with the indicated letter and use it to cover the letter of the affected system in the indicated station. (Do this for each affected system if more than one is indicated). For an intruder, take the oval token with the intruder's picture and place it in the indicated initial station. Players reveal their action for this turn. (Cards should be turned over left-to-right so that the top half remains on top). Players take their actions in order, starting with the captain, and proceeding clockwise. If you realize that you mis-played your card either by playing it upside-down or by mixing up red and blue arrows, you can say, "Oops, I tripped". You perform the action you intended instead of the one shown by your mis-played card, but your next turn's action is delayed. A delayed action means: the card, if any, that was planned is moved to one turn later. If there is a card there, it is moved one turn later as well, and so on until you move a card into an empty space or until you reach your last action. If your last turn's action has to be moved, it is moved off your board and you do not get to execute it. Red and blue arrows - Move your figure through the door and into the adjacent station in the indicated direction. It does not switch decks. If your figure is already in the zone of the ship of that color, it does not move. Gravolift move - Move your figure to the adjacent station on the other deck. It does not change zones. If the gravolift between those stations is damaged or if another player used that gravolift before you on this turn, you make your move anyway, but your next turn's action is delayed. System activation or repair - Activate or repair the indicated system in your figure's station. If the system is malfunctioning (as indicated by an oval token) this action is a repair. Add one red block to the malfunction's card. If the card now has at least as many red blocks as it has hit points, the malfunction is repaired. In this case, give the card to the captain and remove its token from the internal threat Trajectory Board; also remove its oval token (or tokens) from the Spaceship Board. If the malfunction cannot be repaired your action has no effect. If the system is affected by several malfunctions, the repair action acts on the repairable malfunction with the lowest numbered token (even if the system is also affected by an unrepairable malfunction). The oval token is removed only if all malfunctions affecting the system are repaired. If the system is functional (no oval token), this action indicates activation of the system. Action A is firing the weapon at that station. Action B is an energy transfer. Action C has a station-specific meaning. Firing a heavy laser or the pulse cannon - Take a green energy block from the reactor in the same zone and place it on the weapon you are firing to denote activation. If the reactor has no blocks or if the weapon already has one block, this action has no effect. Firing a light laser cannon - Take the yellow block from the power pack below the cannon and place on the cannon to denote activation. If this has already been done this turn, your action has no effect. Transferring energy to shield - Add green blocks to the shield from the reactor in the same zone until the shield is at maximum capacity. If there are not enough green blocks to fill it, move all there are. Transferring energy to lateral reactor - Add green blocks to the lateral reactor from the central reactor until the lateral reactor is at maximum capacity. If there are not enough green blocks to fill it, move all there are. Re-fueling central reactor - Return one fuel capsule to the bank. Add green blocks to the central reactor from the bank until it is at maximum capacity. If there is no fuel capsule, your action has no effect. Maintaining the computer - Take one block from the computer on the bridge and place it on the Computer Maintenance step of the Mission Steps Board in the row corresponding to the current Player Action step. If a block is already there, this action has no effect. Launching a rocket - Take one rocket figure from the station and place it on the first square of the rocket track. If there are no rockets left in the station or if this square is already occupied, your action has no effect. Activating or re-activating a battlebot squad - If you are not leading a battlebot squad, take the battlebot squad figure lying in storage in that station and set it upright next to your figure. For the rest of the game, the battlebot squad figure moves with your figure. If the battlebot squad in this station has already been activated, your action has no effect. If you are leading a disabled battlebot squad (lying next to your figure) set the battlebot squad figure upright. Your battlebots are active once again. If you are leading an active battlebot squad, your action has no effect. Taking off in the interceptors - If you are leading an active battlebot squad, move your figure and the squad figure off the ship into space. If you have no battlebot squad, if you are leading a disabled battlebot squad, or if another player's figure is already in space, your action has no effect. When you are in space, you are not in any station or zone. Threat actions and effects that knock out, delay, or otherwise affect players on the ship do not apply to you. Delays due to failure to maintain the computer do not affect you either. The interceptors will attack threats on the turn you take off. Attacking with the interceptors on subsequent turns - If you start the turn in space, your legal action is . 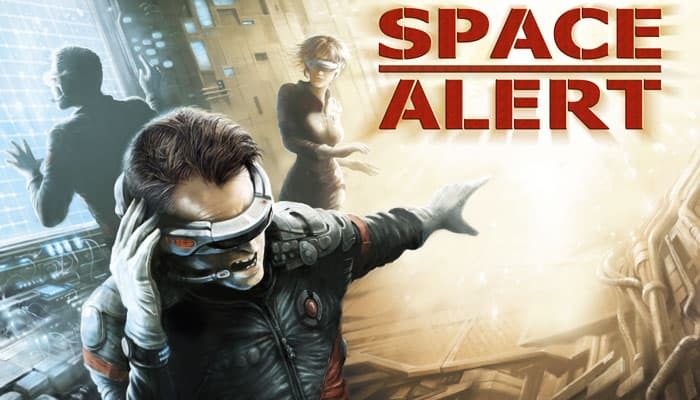 Action keeps you in space and initiates another attack with the interceptors. If you take no action, you and your battlebot squad return to the ship in the upper red station. Any other action or movement is delayed. (The delayed action is shifted ahead one turn, creating a "no action" indicating return from space). Performing visual confirmation - At the end of the Player Actions step, take a block from the window and place it on the numbered square on the Mission Steps Board that corresponds to the current phase and the number of players that performed visual confirmation on this turn. If there is already a block on a lower square, move it to the new square instead of taking a new block from the Spaceship Board. If there is already a block there on that square or a higher square, visual confirmation has no effect. Attacking with the battlebot squad - If you are leading an active battlebot squad in a station, your battlebot squad attacks an intruder in that station. Place one red block on the intruder's card. If the intruder has at least as many red blocks as hit points, it is destroyed. 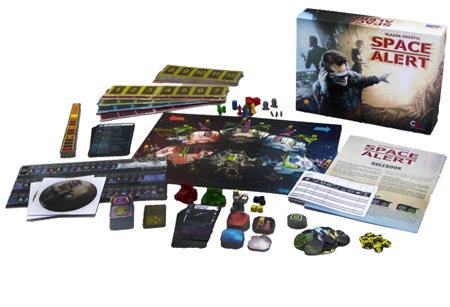 Give the card to the captain, remove the intruder's numbered token from the internal threat Trajectory Board, and remove the intruder's oval token from the Spaceship Board. If the intruder has the symbol, it returns fire. Your battlebot squad is disabled. Lay its figure down next to yours. It continues to follow your figure. If there are multiple intruders in your station, your battlebot squad attacks the one with the lowest numbered token. If you are leading a disabled battlebot squad, if you are not leading a battlebot squad, or if there is no intruder in your station, your action has no effect. Attacking with interceptors - If you are leading an active battlebot squad in space, this action keeps you in space as described above. Heroic movement - Move your figure directly to the indicated station, regardless of how many other stations and damaged gravolifts are in between. Heroic shooting - Fire the weapon at your station according to the rules for executing action A. For this turn, the weapon has 1 extra strength. This even applies to the pulse cannon. Heroic energy transfer - Transfer energy according to the rules for executing action B. If this transfers at least one block of energy, add an extra block from the bank to the receiving energy system. This may allow a reactor or shield to exceed its maximum capacity. This even works when refueling the central reactor. Heroic repair - If this is used as a repair action, give the malfunction 2 red blocks instead of 1. Heroic battlebot attack - Battlebots attack an intruder according to the rules for action . Even if the intruder returns fire , the battlebots are not disabled. In space, interceptors attack according to the rules for action but with 1 extra strength. Damage to external threats is computed in this step. Internal threats have already been dealt with in the Player Actions step. Nothing in this section applies to internal threats or the internal threat Trajectory Board. All cannons with a green or yellow block do damage. A rocket on the second square of the rocket track does damage. 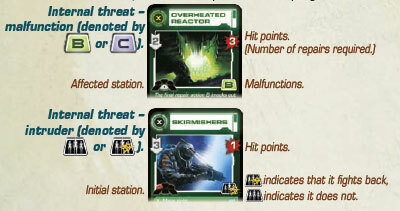 (A rocket fired on one turn does damage on the following turn). Interceptors do damage if there is a player in space. (Interceptors attack on the turn they take off via action C as well as on turns when they remain in space via action ). Trajectories are divided into three distances. The five squares nearest the ship are at distance 1. The next five squares are at distance 2. The rest of the trajectory is at distance 3. Each weapon has a range (indicated by 1, 2, or 3 squares) and a strength (yellow number). First determine which threats are targeted by which weapons. The text on the card may modify the ways in which it can be targeted. If a weapon has no targetable threat within range, it does no damage. A heavy or light laser cannon will only target 1 threat in its zone. Laser cannons have a range of 3, so they can target a threat at any distance. If there are multiple threats in a laser cannon's zone, it targets the one closest to the ship, i.e., the one whose token is closest to its trajectory's Z square. If multiple threats are on the closest occupied square of the Trajectory Board, the lowest numbered one is targeted. If there is no targetable threat on a zone's trajectory, that zone's laser cannons target nothing. The pulse cannon targets all threats in all zones within range on all, that is, at distance 1 or 2. A rocket targets the closest threat on any zone's trajectory. If multiple threats are the same number of squares away from the Z square on their trajectories, the rocket targets the one with the lowest numbered token. Rockets only have a range of 2. If there is no targetable threat at distance 1 or 2, the rocket is returned to the bank without doing damage. Interceptors target all threats within range, but they only have a range of 1. If there is only one threat at distance 1, interceptors attack it at strength 3. If there are multiple threats at distance 1, interceptors attack all of them at strength 1. Threat tokens advance in order, starting with the one with the lowest number. When a threat's token advances, it may perform one or more actions. After all threat tokens have advanced, move any rocket on the first square of the rocket track to the second square. A threat's token advances on its Trajectory Board a number of squares equal to its speed. If it lands on or passes over a square labeled X, Y, or Z, it immediately performs the indicated action. If it passes over multiple such squares, it performs all the actions in order. When a threat gets to the end of its Trajectory Board it performs its Z action and can no longer be affected by the players' actions. The players have "survived" the threat. Give its card to the communications officer and remove its token from the Trajectory Board. It will take no more actions. For an intruder that has performed its Z action, you also remove its oval token from the Spaceship Board. For a malfunction, however, the oval token remains. The affected system becomes unrepairable once the malfunction has performed its Z action. Attack n - This indicates an external threat's attack of strength n on the zone corresponding its trajectory. The attack does n damage to that zone, but this damage can be reduced. Each energy block in that zone's shield reduces the damage by 1, but the block must be returned to the bank. If the shield has at least n blocks, you remove n blocks and the ship takes no damage. Otherwise, you remove all blocks and the remaining damage is applied to that zone. For each point of damage remaining, draw one octagonal damage tile from the zone's damage tile stack and place it on the part of the ship depicted. That system becomes less effective. Reduces strength of light or heavy laser cannon. Reduces range of pulse cannon. Reduces capacity of shield or reactor. Any excess energy is immediately returned to the bank. Damages gravolift. Gravolift actions in this zone will delay the following turn's action. Structural damage has no special effect. Each zone has six damage tokens. If you have to draw a seventh, the zone is destroyed and your crew loses the game. Attack n on all zones. - Attacks on multiple zones are dealt with from left to right (red, white, blue). Each zone has to deal with an attack of strength n.
Attack equal to its remaining hitpoints. - The strength of this attack is determined by subtracting the red blocks on the card from the threat's hit points. Deal(s) n damage. - Internal threats deal damage that is not affected by shields. The damage is done to the zone where the internal threat's oval token is. Draw that many damage tiles. +-n shield point(s). +-n speed. Shield points = n. - Some threats can change their parameters. Use black blocks to indicate reductions and white blocks to indicate increases. Heals (repairs) n damage. - Remove n red damage blocks from the threat's card. If the threat has fewer than n damage blocks, remove them all. Move(s) left. Move(_) right. Change(_) decks. - Internal threats use these actions to move about the ship. Move the threat's oval token into the indicated adjacent station. Internal threats can change decks regardless of the state of the gravolift. (All players on ship, players in this station, players in this zone) are delayed. - Players in the specified group have their next turn's action delayed. (All players, players in that station, etc). are knocked out. - The specified players are knocked out of the game. Lay their figures down on the game board. Their remaining actions have no effect. It is possible to complete the mission even with all players knocked out. If a player leading a battlebot squad is knocked out of the mission, lay the battlebot squad figure on its side as well. It will be disabled for the rest of the mission. Takes over ship. Destroys ship. Ship breaks apart. - An action indicating that something final has happened to the ship means that the players immediately lose, regardless of damage. There should be a block here when the mission step marker gets to this space. If there is not, it means the players have failed to maintain the computer in the first two turns of the phase. Each player's next turn's action is delayed. 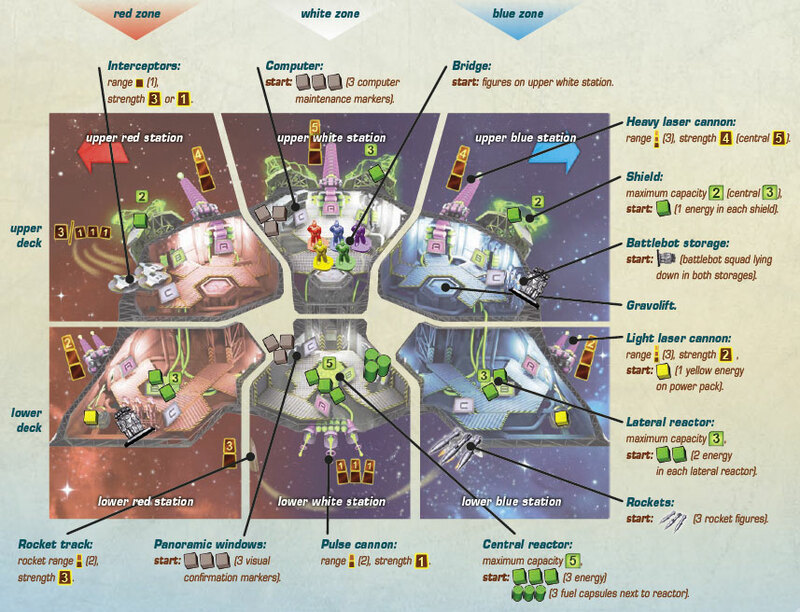 In the thirteenth turn, just before the ship jumps into hyperspace, players get no actions. However, a rocket fired in the twelfth turn will still be flying toward its target. Compute its damage in this step. Any player out in space with the interceptors also returns to the ship at this time. The threats also get one more Threat Actions step on the thirteenth turn. If you complete the mission, you can count up your score. You don't get any score when you lose. Threats you survived (which are kept by the communications officer) earn you the lower point value. Threats you destroyed (which are kept by the captain) earn you the higher point value. Total damage done to all zones of the ship. Damage done to the most damaged zone. 2 points for each player knocked out of the mission. 1 point for each battlebot squad that is still disabled when the mission ends. Finally, add in any points for visual confirmation. (These points should have been marked with blocks on the Mission Steps Board). The result is your score, which you can write into your ship's log. Each page of the ship's log is for a single crew. The first line is for the names of the crew members. You can use marks to denote roles: a star for the captain, head phones for the communications officer, and an exclamation point for the chief of security. Difficulty level of common threats: 1 for white-symboled, 2 for yellowsymboled, 1+2 for both mixed together. Difficulty level of serious threats: 1 for white-symboled, 2 for yellowsymboled, 1+2 for both mixed together. Points for threats survived (kept by communications officer). Points for threats destroyed (kept by captain). Penalty for damage, knocked out players, and disabled battlebot squads. You can also record failed missions in the flight log. In this case, do not fill in the scores. You can use the space to write in the name of the threat that finally destroyed your ship.